Crown rot of wheat (Fusarium pseudograminearum) and dryland salinity cause significant economic losses to the Australian grains industry especially under water stressed conditions during grain filling, but association between them has not been previously reported. We collected opportunistic data on electrical conductivity (EC) and crown rot disease assessments in a replicated wheat germplasm field experiment at Nangeenan, a low rainfall area of Western Australia (WA). A positive correlation (r = 0.63, P < 0.001, df = 28) was found between crown rot index and the composite measure of salinity, computed as the log10 (product of EC values at depths). The simple linear relationship above can be further improved by fitting different intercepts and common slopes for each variety (adjusted R2 = 0.54). 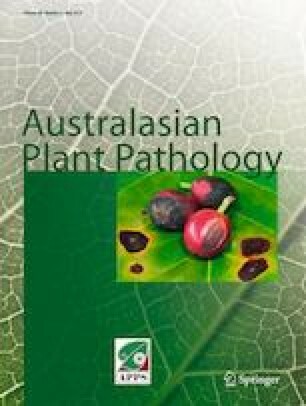 These observations indicate that crown rot symptoms are more severe in saline soils and have implications for the practical advice given to growers as well as for the planning of research experiments on biotic and abiotic factors. Department of Primary Industries and Regional Development (DPIRD) and Grains Research and Development Corporation (GRDC) co-invested in projects UA00159 “Improving wheat yield on sodic-magnesic dispersive soils” and DAN00175 “National crown rot epidemiology and management program.” We thank Kris Gajda for basal browning assessments, and Bec Swift and Kylie Chambers for plant sampling and initial field plot assessments. Land for experimental site and assistance in implementing field experiments by cooperating farmer Ian Sutherland of Nangeenan is gratefully appreciated.